We’re having a week of burger posts at Foodo – so be sure to check in daily! Not totally meat, fried in oil and too small for the bun. What could be better?! The belgo burger is an odd combination of ground beef, egg and spices. Sometimes I’m certain there’s filler in there too. What kind of filler, I don’t know, but it sure seems like there’s filler in there. To add to the lekker (Dutch for ‘tasty’) goodness, the belgo burger is not grilled it’s fried. In oil. Nothing wrong with frying up a burger, I’ve had many a tasty burger cooked on a griddle or a cast iron pan. Here in Belgium though, it’s fried in oil. Lot’s of it. To serve it up it’s put on crusty bun, actually a very good bun although the burger is always too small for the bun. Across the board, Belgians really like a lot of bread with their sandwiches. Really, often when you look at a Belgian sandwich or burger you think it’s just a sliced bun waiting for the good part. Nope, it’s ready, you just can’t see the good part. When Belgians see one of my sandwiches they’re a mixture of appalled, excited, and envious all at the same time, and I tone mine down relative to what goes on in the US. When my Belgian friends visit the US and go get a burger or sandwich, they’re just plain shocked, which is usually followed by euphoria and finally a stomach ache. Finally it’s topped with sautéed onions and ketchup that has so much sugar in it you need an insulin shot. You can get the belgo burger at a variety of places, the market (see photos), a festival, concerts and sometimes the local frituur. 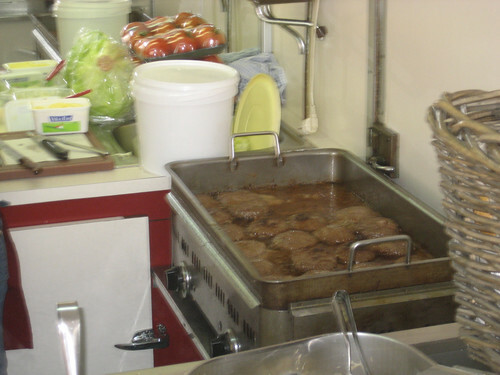 Although the frituur is not recommended as they take the exceptional step and deep fry their burgers. You can also buy them and cook them at home. I can’t understand why anyone would ever do that willingly. Needless to say I don’t eat the belgo burger very often, it is a guilty pleasure of much of the population. Even Niki says, “Oh, those burgers aren’t good… …but they’re so good sometimes. You know what I mean?” In that way they’re kind of like White Castle sliders. To be fair, there are establishments that serve up a reasonable hamburger like you and I would know it. They usually advertise: ‘100% rundsvlees’. Directly translated: 100% Beef flesh. All the meat here is called flesh. I love that about Belgium, everything is very literal. Notice the name of the stand. That translates into ‘Yabba Dabba Do’, as in Fred Flintstone. How can you not want to try one of these now? Wow – those look pretty good. I would pony on up to that cart and buy a burger. This is really interesting. I love reading about food in other cultures, and not just the fancy stuff. Enjoyed every word. awesome information! I admit I not booking a flight to try one- mostly because you walked us through eating one! Thanks for the share! very interesting about the bread to filling ratio! Actually, ‘vlees’ is just our word for meat… Also, you have to try a Bicky Burger (not the regular hamburger) in de frituur. It’s a college tradition here in Ghent, but I’m sure you’d still like it without an alcohol-overload or at a reasonable hour. 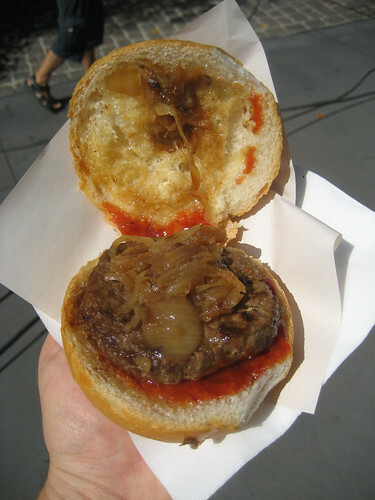 The combination of a toasted bun, fried burger and onions and secret sauces is great! Of een kleintje met stoverijsaus :). 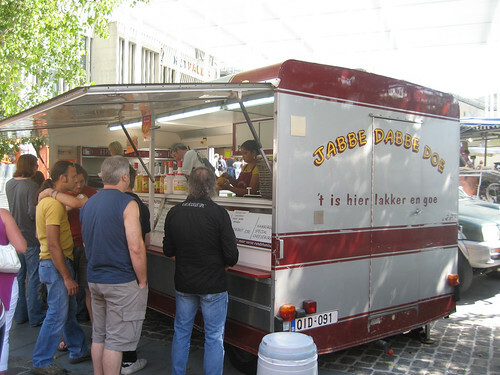 The frituur is really a beloved belgian tradition, as you’ve probably noticed.